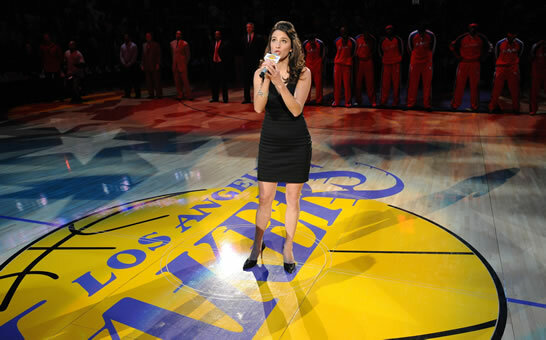 Biola alumnus Melissa Batalles (’07) was studying in Buenos Aires, Argentina when she received an invitation to sing the national anthem at a Los Angeles Lakers vs. Clippers game on Jan. 15, 2010. Unbeknownst to her, Batalles’ older brother had contacted the Lakers and informed them of his sister’s talent saying she would be a great candidate to sing the national anthem. After viewing videos of Batalles online, the Lakers extended her an invitation to sing. “It was very exciting to get that offer, a bit nerve wracking since it is a national and very important song — it has to be done well,” said Batalles. She returned to the United States mid-December after spending the fall of 2009 in Argentina studying with a soprano singer at the Colon Theatre Opera House while also doing language studies in German and Italian. In the short time she had to prepare for singing the national anthem, she took a few voice lessons and sought out a seasoned singer to give her feedback on style. While preparing, Batalles rested in the fact that sound can always be improved and she can always learn to sing better, but if she could focus on her performance being confident, moving and calm, she would see that as success. Batalles was already grateful for the opportunity, however, the “icing on the cake,” as she said, was receiving four front row courtside tickets for her and her family as well as dinner at the club overlooking the court before the game. Having the right perspective and leaning on God’s strength helped calm Batalles’ nerves before her performance. The moment she began to sing, any feelings of nervousness left her. “Learning to have the right attitude when I perform and realize why I do what I do is really important,” said Batalles. Batalles currently resides in Indio, Calif. and works as an operatic singing server at Café Italia, performs as a soloist at various venues and teaches private voice lessons. She credits her education and training at Biola’s Conservatory of Music as instrumental in her growth, especially Biola’s Voice Area Coordinator, Jeanne Robison. “Biola prepared me. Jeanne Robison was developmental in helping me discover my coloratura voice. All the things that were really important for a classical voice, she was the one who got me started,” said Batalles. She thoroughly enjoyed singing the national anthem at the Lakers game and is hoping to do so again in the future. Learn more about Melissa Batalles and follow her career at her website, melissabatalles.com. Written by Jenna Bartlo, Media Relations Coordinator. Jenna can be reached at (562) 777-4061 or through email at jenna.l.bartlo@biola.edu. Biola Alumni Likely to "Crash the Super Bowl"